no show will be charged full booking rate. cancellation up to 7 days prior to arrival date 1st night will be charged at full rate. cancellation after 3 days prior to arrival date 1st night will be charged at full rate plus 25%of full booking fee. Blue Pool Hostel caters for hikers, walkers and backpackers, it is not a party hostel and we discourage weekend party groups. Siobhan & Mike welcome you to the Blue Pool Hostel. 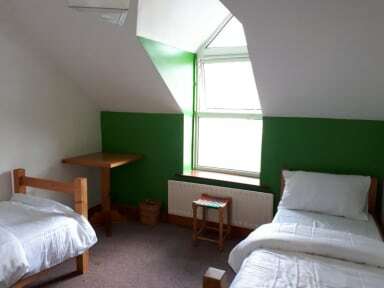 The Hostel is situated in the picturesque village of Glengarriff in West Cork. We offer our guests a warm clean bed in comfortable surroundings with a light breakfast included. Our rooms range from dormitories to private rooms, something for everyone. Towels are available free of charge should they be required. Our friendly staff can provide you with information on all the local amenities and those further afield. Our aim is that you enjoy your stay and come back to visit us. We are centrally located in the heart of the village close to all the pubs and restaurants where you can enjoy the local craic (Irish for fun). Glengarriff is situated on the breathtaking Wild Atlantic Way and is the gateway to the Beara Peninsula. Nearby are the wonderful Sheeps Head and Mizen Peninsulas which are as wild and unspoilt as the Beara. Glengarriff has it all. It is a nature lovers paradise with The Glengarriff Nature Reserve offering great walking and bike trails. Garinish Island which is only a ferry trip away. Bike hire, Whale watching, Golf, Bamboo park, the Ewe Experience, Kayaking and so on; the list is endless. Glengarriff is also the starting point for trips to Kerry and Cork city. We request that all guests observe housekeeping guidelines in shared communal areas, to ensure the comfort of all guests. Blue Pool Hostel is a haven for walkers, hikers and sightseeing. Cancellation policy: 7 days before arrival is free. If cancelled less than 7 days before arrival first night will be taken or for a no-show full booking will be charged. Check in from 16:30 to 21:30 . Exceptions can be made by prior arrangement. In dieses Hostel würde ich aufjedenfall wieder kommen - herzlichster Empfang, Zimmer(Betten) auch Badezimmer top, Aufenthaltsraum total gemütlich, Frühstück sehr umfangreich und bei Fragen oder Sonstiges haben die Hostelbesitzer immer ein offenes Ohr und helfen weiter !! Habe den Aufenthalt sehr genossen! This hostel is located in the centre of Glengarriff, just next to the bus stop, and very familiar. The owners are so friendly and helpful - it's a pleasure to stay there. 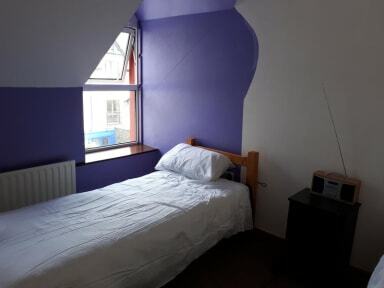 Every part of the hostel is very clean and also cosy. The kitchen even has a roof terrace. Anytime again, thanks a lot! Es war sehr schön. Habe mich sofort wie Zuhause gefühlt. Sehr empfehlenswert. Die Besitzerin ist super nett und kümmert sich liebevoll um ihre Gäste.